Starring: Matt Damon, Jodie Foster, Sharlto Copley, Alice Braga, Diego Luna. The studios have been cranking out moronic SFX extravaganzas all summer. Now that it’s finally August and the kids need to resuscitate their minds in time for school, Hollywood has decided to mix some brains in with the brawn to keep them coming back. Appropriately enough, Elysium stars Matt Damon, the actor with the smarts of Will Hunting and the action-star skills of Jason Bourne. Damon teams up with burgeoning sci-fi director Neill Blomkamp, which marks the filmmaker’s sophomore feature after the sleeper hit District 9. The result is something smarter and more entertaining than the junk that Hollywood has been cranking out all summer. Damon stars as Max, a car-jacker and factory worker on parole in Los Angeles, California, circa 2154. Max lives on Earth with all the other second-class citizens who have been left to rot after the planet has been plagued by disease. The world’s upper crust has fled Earth in a most extreme case of white flight and they’ve settled in a man-made satellite colony known as Elysium. Only the wealthiest Earthlings, the one-percenters, can afford a ticket on the space ship to Elysium. Elysium has all the modern conveniences of privatized living: suburban housing, top-notch health care, and flutes of champagne. Everyone else, the ninety-niners, gets diddly as they live in the slums of LA and wait to die. Max’s life span is cut increasingly short following a mishap at the workplace. Knowing that he can only be saved by the costly medical care of Elysium, which treats patients in surgical pods that resemble fancy tanning beds, Max turns to the black market to get a ticket. 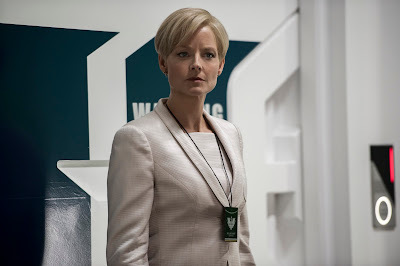 His mission butts heads with Elysium’s Defense Secretary Delacourt, played by Jodie Foster. Delacourt, a frigid woman with an indiscernible accent of aristocracy (Foster also speaks impeccable French), is determined to keep all undesirables outside Elysium’s field, as Blomkamp shows by having the icy politico pull the trigger on three ships of refugees as she sits back in her chic office and sips espresso. It’s unusual to see Foster play the villain, but her bizarre, if consistently watchable, interpretation brings the right amount of detached coldness to act as a foil to Damon’s All-American charm. Elysium is less balanced, though, in its handling of dystopian drama and extravagant entertainment. It's as if Blomkamp mashed two films together and let the studio work it out in post-production. Elysium starts well by introducing an allegorical look at the distant future that holds an intriguing battle between the lengths to which have-nots must go to survive and the extremes to which the haves will go to preserve their idyllic way of life. 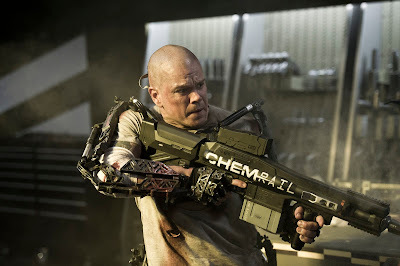 Elysium, however, soon unravels after one thrilling action sequence and devolves into a run-of-the-mill power-struggle. The mess begins once Max squares off against Delacourt’s hired goon, Kruger, played by District 9’s Sharlto Copley (in a surprisingly bad performance). Max’s quest to save his life and, in turn, change the balance of power for the Earthlings and the Elysians, becomes little more than a standard cat and mouse chase once Kruger is on his tail. Elysium also suffers from a corny subplot that reunites Max with his childhood sweetheart (Alice Braga), who needs to get to Elysium so that the miracle beds can cure her leukemia-laden daughter (Emma Tremblay). Earth’s fate takes a backseat to a sickly little child, and the big ideas of Elysium are sucked into a vacuum as the film goes for a sentimental finale, rather than a thought-provoking one. It’s spectacularly constructed entertainment, though, as the work by the production designers and special effects crew are all top-grade, but it’s surprisingly disposable escapism for a film that begins with so much promise. Even if Elysium doesn’t entirely work, moviegoers might appreciate Blomkamp’s effort to do something more with a summer extravaganza. The allegory might be a bit heavy-handed at times—studio films aren’t havens for subtlety—but sci-fi fans will note how the story of the ever-widening rich-poor gap adds a tangible sense of the here-and-now to this tale of the not-so-distant future. (One hardly expects a film with such a sizeable budget to provide such a liberal viewpoint or to let socialized health care play the hero.) Elysium, if you will allow, is District 99%. The annual cycle of cinematic smartness is back on the upward climb after the lazy days of summer. Neill Blomkamp’s Elysium, arguably the least stupid tent pole Hollywood has erected this summer, is a good film to lead audiences through the home stretch of summer movie escapism. It’s loud, explosive, and action-packed, but it’s not completely void of substance. More importantly, it’s not a sequel, remake, reboot, or redid; it’s original. Yes, Elysium might be the film that many moviegoers have waited to see all season. It’s still a letdown, though, if one considers the resounding bang with which Blomkamp introduced himself to audiences in summer 2009 with District 9. Elysium is just as impressive visually as District 9 is, and it’s as solidly crafted an entry into the world of sci-fi, but it’s not as smart as its predecessor is, nor quite as entertaining. Elysium is arguably a good film in its own right, although, for a film with a budget of approximately $100 000 000, it’s a surprising step down from District 9, which had a budget in the ballpark of $30 000 000 and looked just as good, but was twice as fun and ten times smarter. Perhaps the difference between Elysium and District 9 is the difference between studio production and independent filmmaking. Risks and innovation might take a backseat to formula and romance when one ups the ante and plays with thrice the budget. There’s a lot more on the line in Elysium than there was in District 9, but it doesn’t feel like as big of a gamble. It’s not as much of a risk, so it pays off... just not as handsomely. Elysium is currently playing in wide release. All photos by Kimberley French. © 2012 Columbia TriStar Marketing Group, Inc. All rights reserved.